There's some interest in how and why "quality scores" are used in search engine ad auctions. In this post, we will try to describe "why" we use quality scores; a later post will go into "how," including more information about bids. When a user types a query into a search engine, it will typically return both natural search results and advertisements. Google and other major search engines use an ad auction to determine which ads are shown and how much advertisers pay for them. In the auctions, advertisers enter bids that reflect how much they are willing to pay for a click on their ad -- this is called their maximum cost per click (CPC). Ads are then ordered by the product of the bid that is entered and the estimated ad quality score. 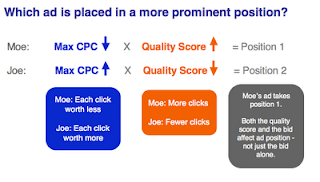 People often ask why ad quality enters the formula -- isn't the bid per click enough? Why can't advertisers just buy their way to to the top ad position? To see why both components are important, let us look at a simple example. Suppose that two advertisers are bidding on the keyword "jet airplane." Joe's Jets is selling actual jet airplanes, while Moe's Models is selling models of jet airplanes. Since jets are expensive, Joe is willing to pay a lot per click. But not many people can afford to buy jets, so Joe won't get many clicks. Moe, by contrast, is willing to pay a lot less per click, but he will also get many more clicks. Which ad should be listed higher in the "sponsored links" section of the search results page? What matters in this decision is not simply an advertiser's value for a single click -– the maximum CPC that the advertiser is willing to pay -- but rather the total estimated value of showing that ad: the value per click times the number of clicks that the ad is likely to receive. The quality score gives search engines a way of aligning the incentives of the buyers, the sellers, and the viewers of ads. The search engine wants to sell ad impressions, but advertisers want to pay for clicks. The solution is for advertisers to bid on a cost-per-click basis, while the search engine estimates the total value of the ad over time: bid per click times the expected number of clicks. This is a neat way to align incentives, but it has a problem: since the advertiser only pays on a per click basis, it may as well seek as many ad impressions as it can so that as many users as possible will be exposed to the ad. Joe might well want to buy the keywords "rocket ship" even if he only has jets to sell. Why not? Joe only has to pay if someone actually clicks on the ad. This is where another distinct, but related quality issue arises: an ad that gets very few clicks shouldn't really be shown. It is just distracting from the viewpoint of users. The advertisers may not care much about annoying users but the search engine certainly does. Why? Because if it shows a lot of irrelevant ads, people will likely stop looking at or clicking on ads. They may develop a terrible affliction known in the trade as "ads blindness." Better ad relevance leads to a better user experience. So search engines often apply a "disabling rule" that inhibits ads with very low clickthrough rates for a given query from being shown. Or they might set a relatively high minimum cost per click for ads that don't attract much interest from users as a way to discourage advertisers from showing ads that annoy users and deliver few clicks. A high cost per click can easily be consistent with a low cost per impression when clickthrough rates are low. So why are quality scores important? Answer: they lead to a better auction by allowing advertisers to buy clicks, publishers to sell impressions, and users to see relevant ads.